The NLG Foundation (NLGF) is pleased to announce the recipients of the 2017 Guild Grants Program. A total of $25,000 was awarded to fourteen grantees to promote membership in the NLG, strengthen programmatic work, and enhance coordination among Guild chapters, committees, and the National Office. Recipients were awarded small grants between $500 and $2,500. After announcing the availability of the grants at the 2017 NLG Convention, the NLGF received 34 requests for funding. Applications were carefully reviewed by the NLGF Grants Selection Committee, which considered how well each proposed project would increase membership in the NLG, whether or not the project would serve as an example to other parts of the NLG, and the project’s ability to raise matching funds and to carry out and promote the proposed work. The Selection Committee also considered geographical representation and subject matter to ensure a broad distribution and to encourage membership growth in under-resourced areas. These small grants aim to enhance the effectiveness of the Guild in supporting movements for social change. Whether it’s by working collaboratively with community partners, providing resources to the broader legal community, or recruiting law students and facilitating deeper involvement, each of the selected projects are finding creative ways to build the Guild. Alabama Chapter to conduct Know Your Rights trainings for tenants facing displacement while fighting redevelopment plans in downtown Birmingham. Detroit & MI Chapter to conduct Know Your Rights trainings in public high schools in Detroit. Detroit & MI Chapter to work with law students to download and organize discovery documents for litigation stemming from the Flint water poisoning. Idaho Chapter to aid local immigrant communities facing law enforcement and ICE targeting through Know Your Rights workshops, bi-lingual content for the chapter website, community security planning guide, and immigration-specific mass defense training. Legal Worker Caucus to develop a legal worker boot camp and accompanying online resource hub. Los Angeles Chapter Housing Committee to create a housing specific student run legal clinic and brief bank and pleadings resource. Military Law Task Force to produce a webinar and legal memo as follow up to brochure and self-help legal guide on military sexual assault and sexual harassment. NextGen Committee of the NLGSF Bay Area Chapter to produce a Know Your Rights video in collaboration with the Arab Resource Center. NYU NLG (anti) Detention Project to disseminate pro se packets and provide advocacy for people in immigration detention around the NYC area. Rhode Island Chapter to provide legal observer and advocacy trainings to support Alianza Mobilizando y Organizando Resistencia. SF Bay Area Chapter to address the mistreatment of Alameda County inmates by publicizing rules, working with public defenders and criminal defense bar, and producing a Know Your Rights pamphlet for inmates on how to file a grievance, and how to stop harassment. TUPOCC-National to train NLG attorneys, activists, students & legal workers via webinar and cross-committee workshops on the nuances of representing Arab & Muslim clients and activists in light of Trump era policies. University of Denver NLG Student Chapter to host two events. 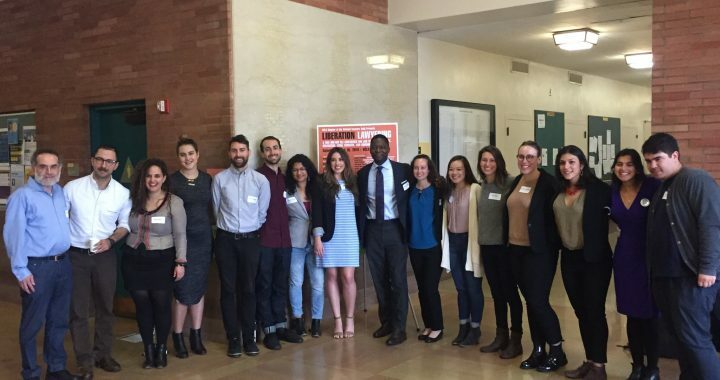 Featured Image: NLG members at the Liberation Lawyering Conference at UCLA in March.